Upon completion of your Tandem, you are eligible to begin the Accelerated Freefall program. The Accelerated Freefall program, or "AFF", is an accelerated method of learning freefall skydiving skills. Jumps are made from 14,500 ft with a freefall of 60 seconds. The student is equipped with both a main and reserve parachute (both are square-type, high performance gliding canopies similar to those used on the Tandem Jump), radio receivers for ground assistance after the student opens the main canopy, an altimeter, automatic activation device (AAD) for the reserve, and other safety equipment. The AFF program can be completed in seven jumps provided the student has mastered the required skills. Before the first AFF jump, the student will receive 6 hours of ground school instruction and prior to each subsequent jump, the student will receive about a 1 hour briefing. On the first three AFF jumps the student is accompanied by two jumpmasters who initially act as "training wheels" in order to stabilize the student in freefall, observe his progress, and correct errors in body position /technique. On the last four AFF jumps, one instructor accompanies the student. 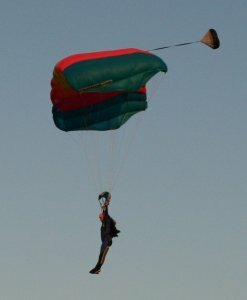 Upon graduation from AFF, the skydiver has all the basic skydiving skills, can make turns in freefall, do back and front flips, move horizontally , hook up with other jumpers, and steer the parachute to a stand-up landing in the target area. AFF Graduates are eligible to continue working on the first skydiving license, the United States Parachute Association "A" License, which takes about 25 jumps to acquire. West Tennessee Skydiving will assist you in acquiring all your skydiving gear at discounted prices.